Israeli forces killed 52 Palestinians on the Gaza border in the conflict's bloodiest day in years on Monday as clashes and protests coincided with the deeply controversial opening of the U.S. embassy in Jerusalem. The embassy inauguration nonetheless went on as planned, attended by a Washington delegation that included U.S. President Donald Trump's daughter Ivanka and her husband Jared Kushner, both White House aides. "Our greatest hope is for peace," he said despite the Palestinian anger the move has provoked. Israeli Prime Minister Benjamin Netanyahu told Trump in his address that "by recognizing history you have made history." Along the Gaza border, crowds built throughout the day in the Palestinian enclave less than 100 kilometers (60 miles) away from Jerusalem and sealed off from Israel by a blockade. 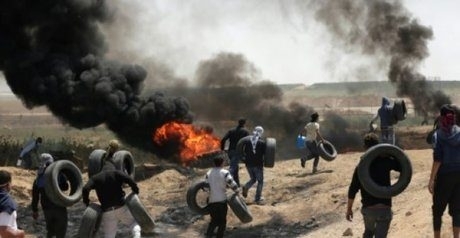 "The rioters are hurling firebombs and explosive devices at the security fence and at (Israeli) troops and are burning tires, throwing rocks and launching flaming objects with the intention of igniting fires in Israeli territory and harming (Israeli) troops." Earlier, a military plane and tank targeted two other Hamas posts in response to what it said was fire toward its forces by Hamas. Palestinian President Mahmoud Abbas accused Israel of "massacres," while Amnesty International called the violence an "abhorrent violation" of human rights. Human Rights Watch denounced a "bloodbath." EU foreign policy chief Federica Mogherini said "we expect all to act with utmost restraint to avoid further loss of life," while British Prime Minister Theresa May's spokesman urged "calm and restraint." Netanyahu defended the use of force, saying "every country has the obligation to defend its borders." Israeli military spokesman Jonathan Conricus alleged "we have seen three different squads, fully equipped terrorist squads with weapons, trying to plant IEDs at the technical fence in three different locations." The inauguration followed Trump's December 6 recognition of the disputed city as Israel's capital. The ceremony took place at what until now had been a U.S. consulate building in Jerusalem. Abbas said the new embassy was tantamount to "a new American settler outpost" in Jerusalem and that the United States "is no longer a mediator in the Middle East." Police and the Israeli military deployed massively. Around 1,000 police officers were positioned around the embassy, while Israel's army said it almost doubled the number of troops surrounding Gaza and in the occupied West Bank. Israeli Defense Minister Avigdor Lieberman said in a message to Gazans "we will protect our civilians with all our means and not enable the fence to be crossed." Beyond the disputed nature of Jerusalem, the date of the embassy move was also key. On Tuesday, Palestinians mark the "Nakba", or catastrophe, commemorating the more than 700,000 Palestinians who fled or were expelled from their homes in the 1948 war surrounding Israel's creation. Palestinian protests are also planned for Tuesday. There had already been weeks of protests and clashes along the Gaza border, with 106 Palestinians killed by Israeli fire there since March 30. No Israelis have been killed and the military has faced criticism over the use of live fire. Israel says it only opens fire when necessary to stop infiltrations, attacks and damage to the border fence, while accusing Hamas, the Islamist movement that runs the blockaded Gaza Strip, of seeking to use the protests as cover to carry out violence.